"Perfect for: Children's reading, encouraging reading, group reading. In a nutshell: Snow Valley Heroes is a great fantasy/holiday book for children and adults alike… Read the book over and over to peel back the layers and see something new! The book contains 13 wonderfully drawn illustrations (black and white), and excerpts from the first two books." "Loved it… This delightful conclusion to the Planet of the Dogs series just caps off a wonderful tradition. The story is well suited to be read aloud to younger children and as chapter book for the older ones. All of your favorite dogs help rescue two of Santa's reindeer from the Evil King of the North. The story also imparts important lessons of cooperation and responsibility." "Snow Valley Heroes: A Christmas Tale is a warm Christmas tale that is sure to delight dog lovers everywhere both young and old…My oldest son, age 5 really enjoyed this book… we read a few pages each night before bed. At times I was a bit confused because I haven’t read the first two books in the series but that doesn’t take away from a really imaginative and fun adventure story and lovely black and white illustrations. I would recommend purchasing these books as a series." "Highly recommended…Attention dog lovers, you'll want this one, too! A tale of compassion and loyalty. A good tale for 9-12 to read; younger kids will enjoy hearing this one read to them." "I loved the suspense in Snow Valley Heroes when the King of the North kidnaps reindeers, Dasher and Dancer. .. As in Robert McCarty’s first book, Planet of the Dogs, this book teaches children to be caring, loving individuals, just like dogs do naturally. The illustrations of Stella McCarty in this book are exquisite and tranquil. You feel yourself right within the pages hugging the dogs! This book may be written for children, but it really is a book for all ages." "Snow Valley Heroes: A Christmas Tale is the exciting story of the dogs from Planet Of The Dogs who come to earth to help save Christmas. … I thoroughly enjoyed reading it. The book brought me back to my youth, a time when it seemed my imagination was endless, something that gets lost in adulthood.The holidays are right around the corner and Snow Valley Heroes would make a great stocking stuffer!"
"I found Snow Valley Heroes, A Christmas Tale, to be absorbing and a real page turner…. My 8 year old son, enjoyed the book tremendously, ... Although it had more words than pictures (he’d rather read comics), he was very amazed that he followed through each chapter and finished it. This is a great Xmas gift for any boy or girl, who loves reading. Definitely a huge bonus for kids who are dog lovers!" 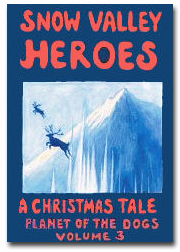 "Snow Valley Heroes, A Christmas Tale, is a wonderful book for a Christmas present. Popular for children and grandchildren, but yourself! Truly for all ages of dog lovers, it is a onetime story that has never been told  how our beloved dogs came to Earth to be part of our lives while bringing friendship, love and loyalty to mankind. Do yourself a favor….pick up a book or two for your children, grandchildren, the school library or public library. And one for yourself! " "Any one of these books would make for a delightfuland one would assume cherished gift for any child. All three would be an amazing reading adventure."